In a time where real actors are almost outnumbered by pop stars and real martial arts actors are found in a generation or two behind, legendary director Lau Kar Leung took it upon himself to show audiences of the new millennium a real martial arts movie. No CGI, no extensive doubling and little wire support made Drunken Master II (1994) a rousing success critically, especially since it came in an era where high flying wire choreography was a staple of the kung fu movie. 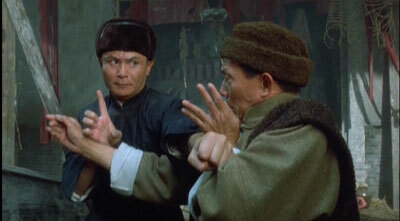 As years have gone by, there has been little audiences demand for traditional martial arts in Hong Kong films though. Drunken Monkey, Lau's first film since Drunken Master III (to put it mildly, not so well received as the sequel), didn't fare that well at the box office but now finally on dvd, a larger quantity of fans can watch and make up their minds whether Lau has delivered something rarely seen in Hong Kong cinema nowadays. I.e. a Shaw Brother's production and fight choreography of real quality. As with 36 Chambers and a few dozen other films in the genre, the opening is a martial arts showcase for the main performers in the film. A scene that never functions as something that actually had anything to do with the story but as a nice start to show off what's to come. Have to admit I felt a rush here, as I probably will mention in the review a few times, it takes you back to a genre rarely seen done today. Drunken Monkey, with its structure doesn't have to be a 2003 movie, feels like part early 90s New Wave and with it's kind of action, something more from the 70s. That is a good feeling because you see aspects you took a liking to in the first place, coming from a fan of the eras mentioned. Which in itself probably was the goal for director Lau. To get the old seasoned audiences back to the theater and if you make a few new fans out of it, then that's a bonus. I'm no lifelong fan of the genre but thoroughly appreciates the old school way. The plot, with staple themes such as betrayal, revenge, maniacally laughing villains etc isn't groundbreaking stuff by filmmaker Lau Kar Leung. Martial arts films, not all classics though, aren't there to display refined storytelling and even the best ones have their basic story structure. A structure that merely functions as a way of getting characters into action and into each others life. Much more is not needed if your primary goal is to deliver action. True in the case of Drunken Monkey and the viewer is quickly involved in the simple plot to set up Bill Man's trusted comrades betrayal of him. You have no objections to all of this this because it does flow well for the first 20 minutes, though a melodramatic scene early on isn't exactly subtle or involving. Within those 20 minutes we also find a good dose of fight action including a good, long set piece where the seemingly immortal Bill Man tries to fight off his opponents. When the film cuts to one year later and introduces Jacky Wu, among others, the comedy aspect enters and I can expect many viewers to simultaneously go 'uh-oh' here. Admittedly the first comedy scene featuring Jacky Wu posing in different monkey positions while tied to ropes is pretty funny but this middle section of the film falters quite a bit. I realize this type of Hong Kong comedy shtick can work really well with local audiences (you have to think commercially in some ways still) but I also sense that this type of comedy isn't strictly local either. It truly isn't very funny watching these characters, mainly through dialogue, trying to win the audiences over after the serious opening reel. Jacky Wu has a likable screen presence and persona but that's about it for plus points in regards to the humour. Lau proved with Drunken Master II that this type of element to a film can work wonderfully well with a charismatic set of actors. There you had Anita Mui, the straight faced Ti Lung and Jackie Chan registering several memorable moments but in Drunken Monkey no such actors can be found. It doesn't help either that Lau has basically copied Anita Mui's character from Drunken Master II into the mother character and you know what they say about copies. Still, it all doesn't exactly become boring because Lau, maybe just in time, starts to reconnect to the main plot and steadily finds a way back to his basic structure with action in between. For the investors, audiences etc. it may not have been terribly compelling, although I would pay for it, to watch only the veteran players inhabit this picture but looking at the script, it's clear that Ka-Yip and granduncle Chan really could've been lifted out and the movie would've worked, maybe even better. Jacky Wu's presence is welcome because he's a capable martial artist obviously but it's a script sidenote that kept popping up in my head. Production values are decent but one, it's not shot in the wonderful 2.35:1 Shawscope which would've been the ultimate nostalgic moment and two, the movie looks a bit flat. It was one observation someone made who saw this before me and looking at the middle section and all it's sets, thoughts go to a kind of TV look for some parts of the film. Lau chooses not to be very cinematic with big tracking shots and while the different settings looks good in their own right, it's far from that Shaw's feeling you might EXPECT.. But who wants to know about story structure, camera, lighting, production design when Drunken Monkey is interesting for one reason only, the fight choreography by Lau Kar Leung and Lau Kar Wing. Again, it has the feeling of something not from 2003 because mainly and frankly, you can actually see what the fight choreography is like. Both Lau's aren't from the MTV school of shooting action and before going into more detail, I have to say they've delivered the goods based on what they have. This was not a project with huge funding behind it and one of the main performers is getting on in years, namely Lau Kar Leung himself. Showing off traditional martial arts is quite thrilling though and the action suitably escalates as the story goes on. Very little reliant on wires, only for when the monkey style requires it and Lau performing most of his action without a double all looks good. The occasional choppy editing appears and a few sequences (in particular the tunnel fight) appears a little too quick edited for my liking. The reason action nowadays isn't terribly compelling in Hong Kong cinema is because there are so little actual performers. Few martial arts performers from the old days put acting first and that's why we've seen so many memorable moments of fight choreography over the years. Movies were rarely a showcase for acting. 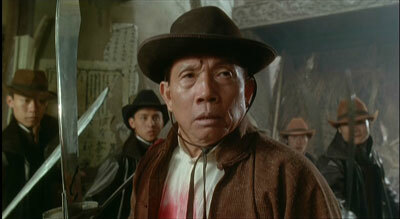 Jacky Wu for example performs very well under the direction of Lau's but wouldn't be mistaken for a good actor. His technique is allowed to be captured on camera and not knowing much or how to talk about action directing, I have to say that watching Lau and his brother Gordon fighting side by side is truly exciting plus it is quality choreography as well. All in all, the fight choreography has been done better, obviously, in the past but it's been a long time since we've seen any! Thank you Lau Kar Leung! Drunken Monkey isn't THE return for martial arts moviemaking like it should be but more importantly it shows Lau Kar Leung still has it in him when given the chance. Will today's audiences accept this? I don't know but I hope the veterans at least will take a liking to the action aspect. I hope Lau is given the opportunity to build on this, given a higher budget and more real performers to perhaps deliver a final masterpiece. He's not going to be around forever and it can not die with him. 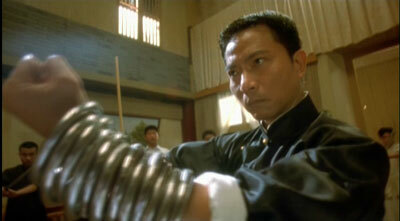 Learn from this and don't let any of the pop stars near Lau Kar Leung! Asia Video Publishing in association with Celestial presents Drunken Monkey in it's original 1.85:1 aspect ratio. This newly struck print looks good with strong colours and blacks but is ever so slightly too high on print damage and softness. The Cantonese Dolby Digital 5.1 audio was post synced (Jacky Wu is a Mandarin speaker but there's no sync sound recording on the alternate Mandarin 5.1 track). Music makes the frontstage active rather than the fight action. Decent. A Cantonese 5.1 DTS track is also included. The English subtitles were of very high quality and has poor sentence structure at a few points rather than spelling errors. Traditional and simplified Chinese subtitles are also included. Only extra is the excellent theatrical trailer, starting with the old 80s Shaw Brother's logo as a nice touch. The original teaser trailer I first saw makes no appearance here.